Some days you just need a good over-the-top glitter on your nails, and for me that's sometimes when I feel stuck with the blahhhhs. 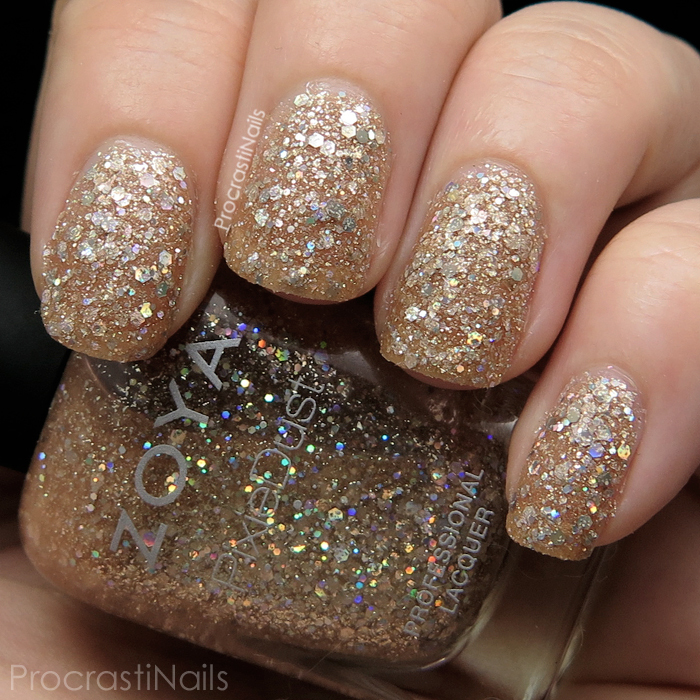 One of my sure-fire pick-me-ups is Zoya Bar - a gold textured Magical PixieDust packed with all sizes of scattered holo glitters. It makes me feel like my nails are going to the ball and helps me to forget any other issues going on each time I catch a glimpse of my nails. You're going to want to check under the cut because I think it's even more stunning with top coat! 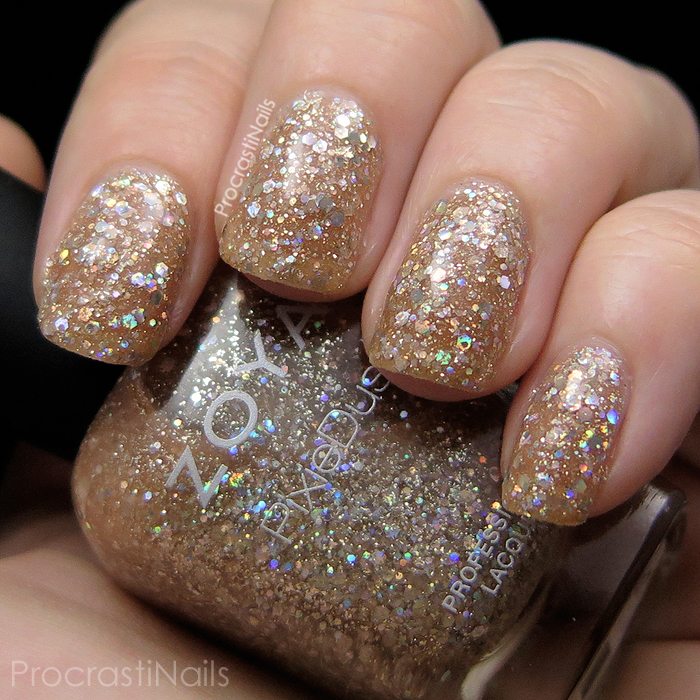 Bar was one of the polishes in Zoya's Summer 2014 Magical PixieDust Collection. The 'Magical' part comes from the fact that they have more texture and a variety of glitter sizes thrown in which means they wear very differently on the nail than regular PixieDusts like Liberty. The base is a sheer goldish tan jelly so it did take me three coats to build up to this much coverage. I know a lot of people thought the Magical Pixie Dusts were too chunky but I seriously love them (but then I also loved Essie Belugaria a WHOLE LOT). Look at all that colour in the holo shift from the hex glitters! I think the fact that the golden tan base is a neutral colour helps this polish not be too over-the-top, even with it's texture and glitter factor. And the colour only pops more when you add top coat, so let's check that out too...! Ohhhh my gosh. Drool, right? A thick layer of top coat helps everything smooth down and gives the glitter more of a chance to reflect the light and pop with colour. My day has definitely picked up with this colour on my nails. It makes me feel cheery and confident and a little bit excessive and I love it. 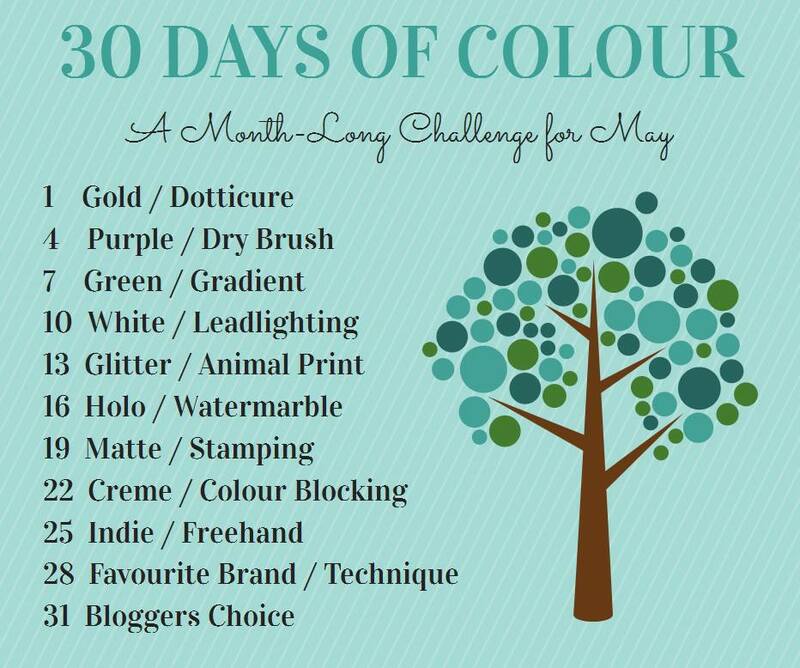 :) Definitely a good colour to start off my May 30 Days of Colour fills with! Which way do you prefer Bar, glossy or textured? For some reason the Pixie Dusts were a no-no for me. But it's good to have a special polish to reach for when we don't feel good! I love PixieDusts. I just have this thing with textures that make me fall in love every time. Ultras are even better! Beautiful swatches! Such a pretty texture polish! Funny how much you love it, that isn't something a lot of people can say about these! Proves that there's an audience for everything and that's what I love about the nailworld :). This was actually one of the only magical pixiedust polishes that I actually liked. The color is just stunning! Beautiful! I love PixieDusts, and I'm usually more of a fan of the original formula. But this one isn't too chunky for my taste - it's stunning!